3. On the Events page, look for the name of the event. 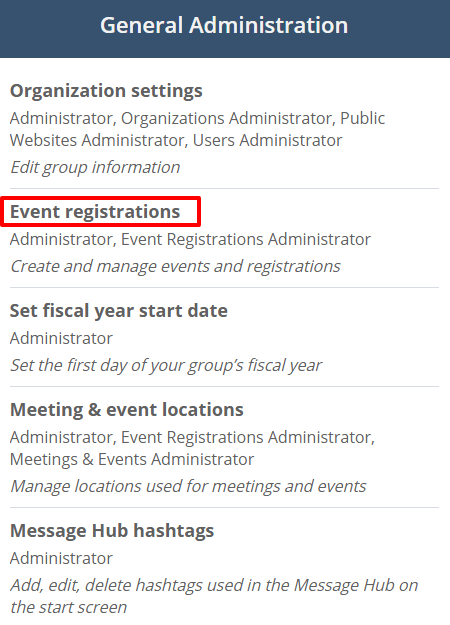 Click the magnifying glass icon under the registrations column of the event where you want to add the registration. 4. Click the red Administration icon and select Add Member (for members) or Add non-member (for non-members). Click Complete and pay online if you want to pay via credit card. Click Complete and pay with check if you want to pay via check. Note: The online form does not have the "check" option. That is only a choice through this admin interface. So anybody paying with a check will need to be entered through this interface.